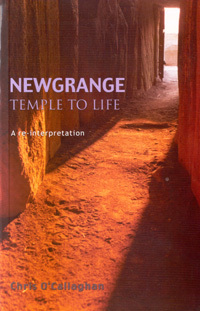 Chris O'Callaghan in his book Newgrange - Temple to Life puts forward the case that the passage tomb description of Newgrange is incorrect. Chris states "I propose that the commonly coined 'passage grave / burial tomb' description seriously misrepresents what the leaders, astronomers, architects, engineers, artists, builders, as well as the hundreds of workers, achieved on the Newgrange ridge over 5,000 years ago: a fusion of belief, astronomy, engineering and logistics that works as efficiently today as when declared open for business over 5,000 years ago"
Newgrange - Temple of Life on Google Books. Chris argues that the Sun Window provides the key for the reason for building the Newgrange monument. The brilliant design guarantees the solar invasion of the 24 metre long passage and end chamber at dawn, for six days on either side of 21st December Winter Solstice. Each early morning penetration lasts for a maximum of 17 minutes, softly bathing the end chamber and the stone offering basins within the 3 alcoves with an ethereal light. Very few human remains were found inside Newgrange, Chris suggests that wild animals could have brought body parts into the mound which could account for the fragments found. None of the usual burial goods were found, no pottery receptacles, no art or decorations suggesting death, sacrifice or burial. Chris believes that Newgrange was constructed to celebrate the union of the Sun God with Mother Earth. The carefully constructed Sun Window allowing the Sun God to penetrate the passage of the mound (representing Mother Earth) reaching deep into the chamber (representing the womb). "When you visit Newgrange, you too may realise that you are entering the manifestation of one of the world's most ambitious concepts - the marriage between the all-powerful Sun, without which life in any form would be impossible, and our Earth Mother, herself the generous provider of all the gifts that we can ever require". Newgrange - Temple to Life by Chris O'Callaghan. 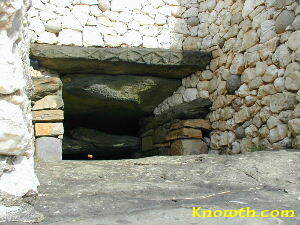 The book challenges the claim that the 5,200 year old Stone Age monument at Newgrange was a burial tomb. Chris O'Callaghan argues that the classification of Newgrange as a passage-grave "seriously misrepresents" what the ancient people who built the monument were about. Chris O'Callaghan said there was "no sign that Newgrange had been used as a catacomb, a mortuary, necropolis, royal or otherwise, or a crematorium. Despite the assumptions, there is not the faintest evidence that Newgrange had ever been used as any sort of dedicated repository for bodies, bones, burial artefacts or ash."